UPDATED – WASHINGTON (CNS) — Catholic Charities agencies joined emergency response efforts in coastal communities in four Southeastern states as residents and parish staffers began returning to assess the damage Hurricane Matthew left behind. Some evacuation orders remained in effect in South Carolina, where the storm came ashore Oct. 7, dumping up to 18 inches of rain in communities near Charleston. High water blocked some roads, preventing people from returning to their homes in South Carolina and North Carolina and others were prevented from leaving their homes as they awaited the delivery of food and water. In Florida, churches sustained serious damage and the historic Cathedral Basilica of St. Augustine in St. Augustine experienced flooding, preventing Mass from being celebrated indoors the weekend of Oct. 8-9. One Catholic Charities official in North Carolina said that in discussions with some residents he learned that the damage and flooding caused by Matthew exceeded that of the powerful Hurricane Floyd in 1999. Parishes and schools in the Diocese of Savannah, Georgia, escaped the brunt of the storm. Trees were reported down on some parish properties, but no major damage was reported, said Barbara King, diocesan director of communication. Some South Carolina communities in in Horry, Georgetown and Williamsburg counties faced the possibility of flooding, even though the storm’s initial fury bypassed them. Kelly Kaminski, a regional coordinator for Catholic Charities of Charleston, said Oct. 10 that authorities were keeping an eye on rivers that continued to rise from runoff from Matthew’s torrential rains. Many of the same people affected by the storm or worried about potential flooding continue to recover from the historical floods that swamped the state a year ago, she said. “We’re working with over 2,000 clients just on the flood stuff. Now in addition we have to handle everything from Hurricane Matthew,” Kaminski told Catholic News Service. Kaminski had no word on damage to churches and schools because evacuation orders in some communities remained in effect. New flooding also was a concern in North Carolina, said Daniel Altenau, director of communication and disaster services for Catholic Charities in the Diocese of Raleigh. “The major concern right now is that rivers are increasingly rising. The flooding is not expected to peak in some areas until Friday (Oct. 14) and may not begin to subside until the 15th,” he told CNS. Catholic Charities planned to begin distributing food cards to families by Oct. 11 as people either returned home or could be reached by some of the 55 to 60 agency staff members working in the affected communities, Altenau said. “Many of our own staff has been affected, which has limited the ability to be in the community,” he explained. Hurricane Matthew’s worst punch missed much of the Florida coast. 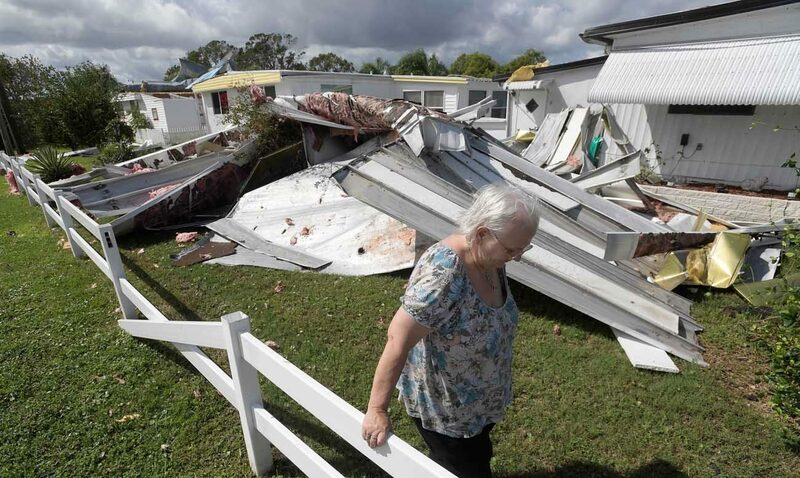 The most serious damage occurred in the Diocese of St. Augustine, where church properties were seriously damaged or flooded and homes were destroyed. Kathleen Bagg, director of communications for the diocese, said downed trees littered the property of the Mission Nombre de Dios and the Shrine of Our Lady of Le Leche. A tree fell onto the roof of the Our Lady of Le Leche Chapel, she said, but did not cause damage to the interior of the structure. The Cathedral Basilica of St. Augustine, which was renovated in time for the 450th anniversary of the city and cathedral parish, sustained enough flooding to render it unusable for Masses Oct. 8 and 9, Bagg said. Mass was celebrated in the west courtyard outside the church, she said. Another church, St. Anastasia on a barrier island across from the center of St. Augustine, is believed to have sustained serious damaged in the storm. Authorities were not allowing residents, many of whom belong to the parish, to return to St. Anastasia Island Oct. 10. Bagg said that power remained out for much of the region, making it difficult to contact other parishes to determine how they fared. King in Savannah said Catholic schools in the area were to remain closed until Oct. 17. Catholic Charities of South Georgia was prepared to assist families and individuals who requested recovery help, she added. In Miami, parishioners at Notre Dame d’Haiti Parish began collecting donations of food for the Caribbean nation, which took a direct hit from Hurricane Matthew. Parishioners prayed Oct. 7 for the estimated 300,000 Haitians affected by the storm. The number of deaths reached 1,000 on Oct. 9, five days after the storm’s 145-mile-an-hour winds and torrential rains slammed into the country, according to a tally by Reuters based on conversations with local officials. However, Haiti’s Civil Protection Agency reported that 336 people had died. The agency’s accounting of casualties is lower because of a policy that requires emergency workers visit each village to confirm the number of deaths and injuries. In the U.S., the death toll stood at 33 as of Oct. 11.